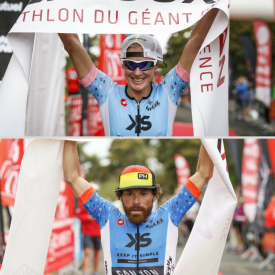 Charleston, SC (June 05, 2018) – XRCEL Athlete Fuel congratulates its ambassadors and KIS Performance Team coaches Carrie Lester and Scott DeFilippis on their sweeping wins of VentouxMan 2018 on June 3. Scott posted a 5:28:07 time and Carrie posted a time of 5:41:26 to earn and share the top pro podium position. “Coming off the top of Mount Ventoux I was starting to bonk a bit but luckily I had 2 XRCELs in transition waiting for me…I negative split for the very challenging run thanks to the fueling of XRCEL!” said Scott. New World Pharmaceuticals is based in Charleston, South Carolina. For more information, please visit Ausshttp://www.NewWorldPharma.com.